Sometimes in the rush to keep up with the latest releases we fail to catch up with some older works, especially ones that predate our arrival on this spinning rock. Mass and social movements was one of the modules on my undergraduate course at the University of Warwick, taught by Professor Jim Beckford, the course was excellent and well put together but I cannot remember a reference to Hoffer, not surprising really as we were in the sociology department and not philosophy. I am still interested in how mass movements emerge and grow, be they scientology, radical Islam or popularist politics focused around Brexit or Trump, they do seem to share certain characteristics. 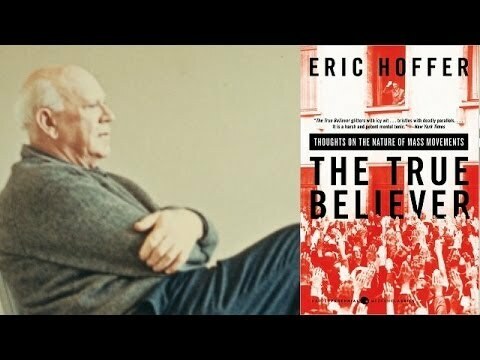 So when I started seeing increasing references to quotes from Hoffer, I had to take a look, I was particularly intrigued by the true believer aspect. I have been a true believer in several guises, I found sanctuary at times in the shelter offered by groups seeking to change the world for a better place. Many of us have been through this phase, those emotions, some are still there, others move on. I found the book very interesting and thought provoking, it was what I expected. It was dated but still incredibly relevant. I sit writing this on Easter Monday, yesterday I was greeted by ‘He is risen, hallelujah’ messages on Facebook from true believers, I later watched clashes between Antifa thugs and pro-Trump thugs on the same platform, I read about the rhetoric emerging from North Korea as America and the Chinese tighten the noose around Kim Jong-un’s neck. All of which are understandable if we look at the how these people, groups and societies for their belief systems and how this informs their behaviour and actions. We now live in an increasingly echo chamber world, I would have loved to read Hoffer’s thoughts on how that was accelerating the ease with which we become true believers. There were things in the book that would have benefitted from a more recent view but it was written post WWII at the beginning of the cold war, the reader needs to exercise a few gymnastics and if they do this book is very useful to analyse what we see around us today. The Jonestown Massacre was post ‘True Believer’ but I bet Hoffer would have used it, referring to the 918 members of the Peoples Temple cult led by one James Warren ‘Jim’ Jones, who committed suicide by drinking a cyanide laced drink in November 1978. Jones was a Disciple of Christ pastor and was a voracious reader, as a child and studied Stalin, Marx, Hitler, Mao and Ghandi carefully noting the strengths and weaknesses of each. Jones was a charismatic leader made for the true believers, and he found them. For me there was another interesting angle. I really enjoy the diversity of the world of martial arts, it is where I train and I earn income from it. I am always happy to explain how we train in Ju Jitsu, its strengths and weaknesses, yes you got that right, weaknesses. You see I am not a true believer in the sense that I can ‘sell’ my martial art as the new way to train and live complete with warrior code of behaviour, Bushido. I see too much of what my friend and Conflict Manager contributor Jamie Clubb calls Bullshitsu, (put his forthcoming books on this subject on your must read list), out there. The world is full of Kool-aid drinkers and there are plenty of them in the martial arts too. If you think a friend is beginning to get a taste for the Kool-aid do them a favour, buy them a subscription to Conflict Manager and Conflict Research Group International. Go read Hoffer, it is very thought provoking.